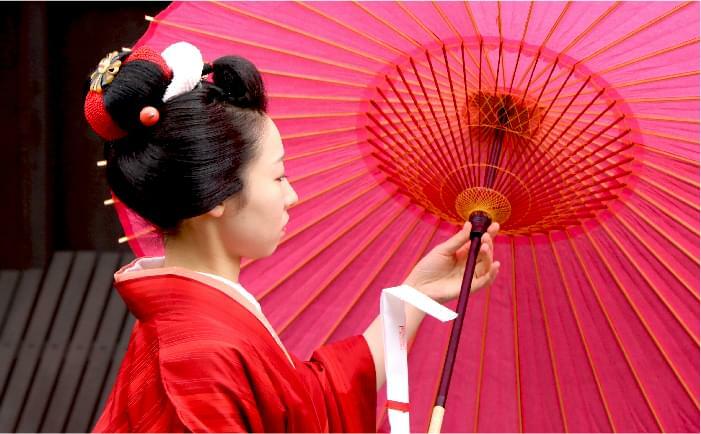 Maiko, or apprentice Geisha, is considered as Kyoto’s most famous icon of the Japanese culture. 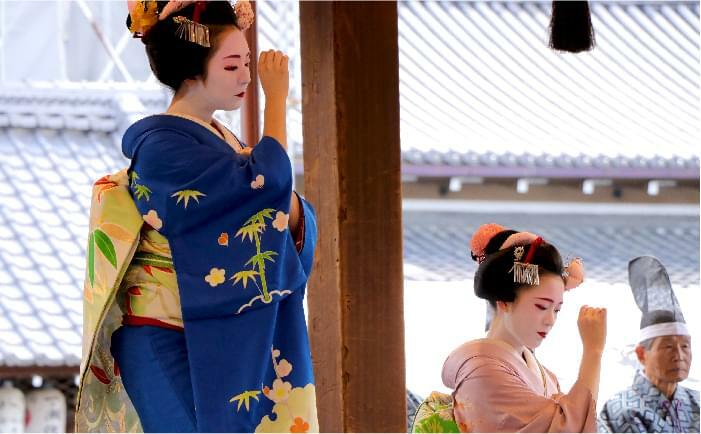 In Gion you can do a Maiko makeover and become a real Maiko yourself! 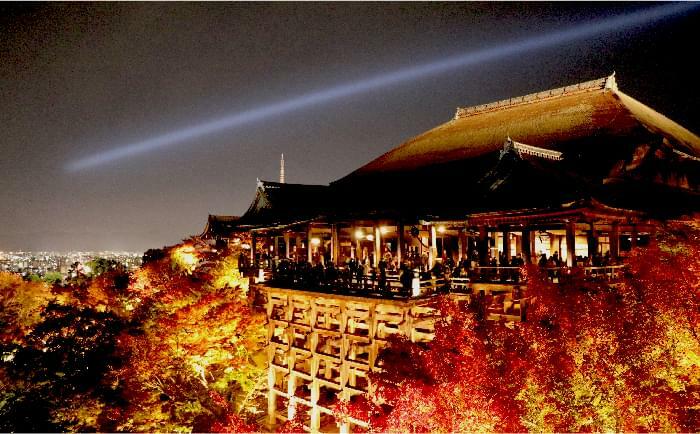 Kiyomizu-dera Temple is one of the most famous temples in Kyoto and is located close by Sakanoue. Especially the autumn foliage is very popular. During the evening in autumn the temple and the autumn leaves are beautifully illuminated and turn the temple into a magical vermilion world. 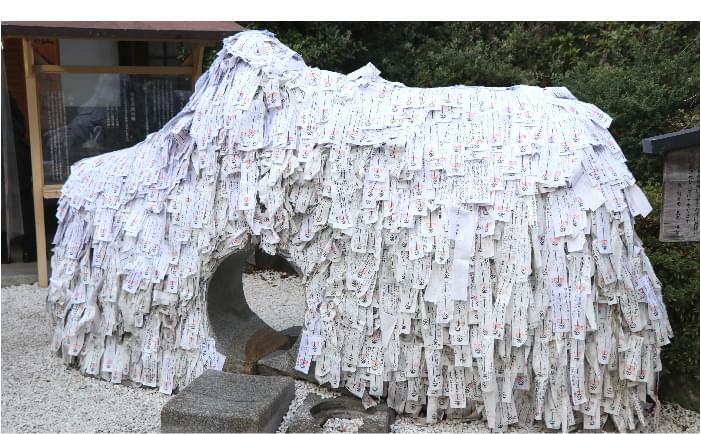 The Yasui Konpiragu shrine is the home to the god of good human relations. One can break off bad relations and initiating good ones by writing down one’s wish on a white amulet, crawling through the hole of the stone and back through again before pinning the amulet on the stone. The shrine is located close by Sakanoue. The Bean-scattering festival, or Setsubun, is one of the most popular annual events in spring and is held on February 2 and 3. People throw beans to drive away the evil spirits and bring in luck. The custom is nowadays often performed at shrines with dedicating dance performances of Maiko. 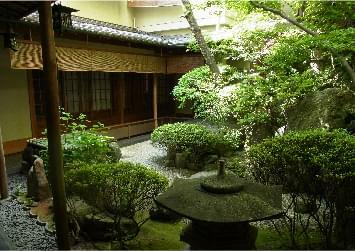 The famous Kodai-ji Temple is located a five minute walk away from Sakanoue. 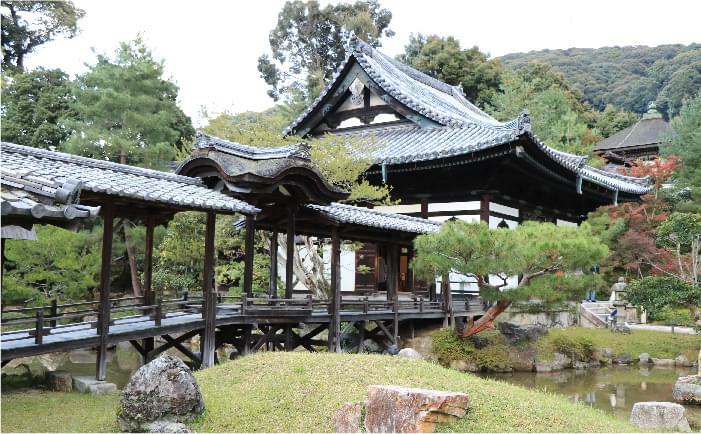 It is said that Nene, the widow of the powerful war lord Toyotomi Hideyoshi, built it to pray for her late husband. This illumination festival is held in March and is one of the most magical events in Kyoto. 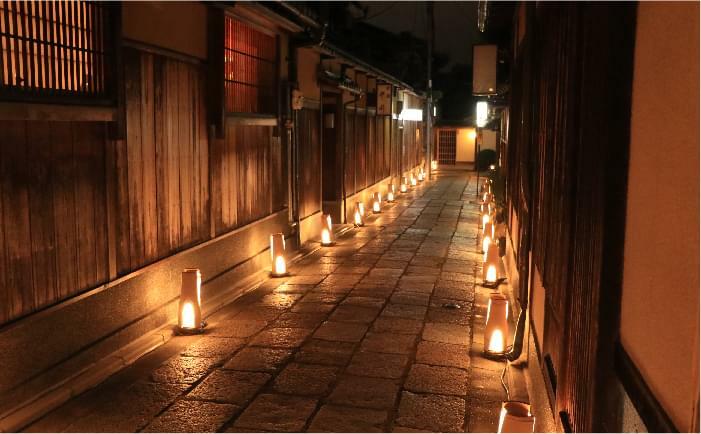 Hundreds of lanterns decorated along the streets turn the Higashiyama area into a romantic world. Famous temples in this area are also illuminated, which makes it one of the biggest events of the year. 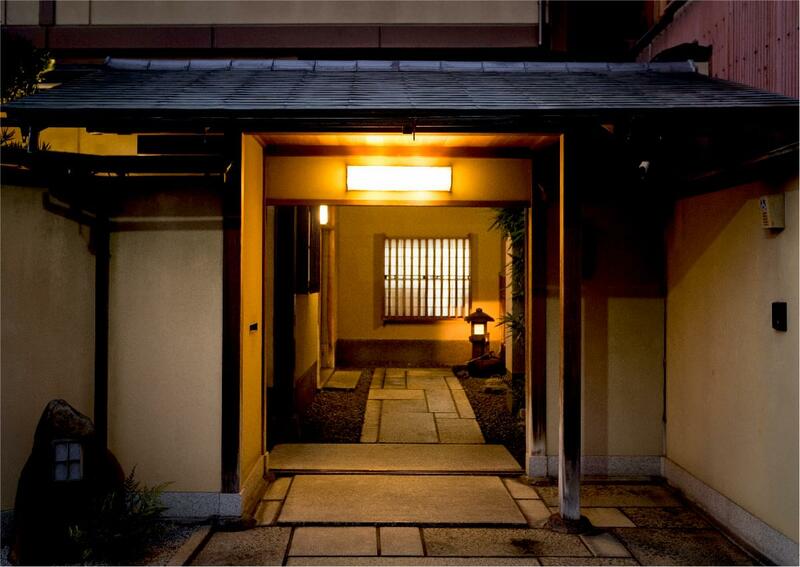 Sakanoue is also located in this area, so we put out a lantern, too! 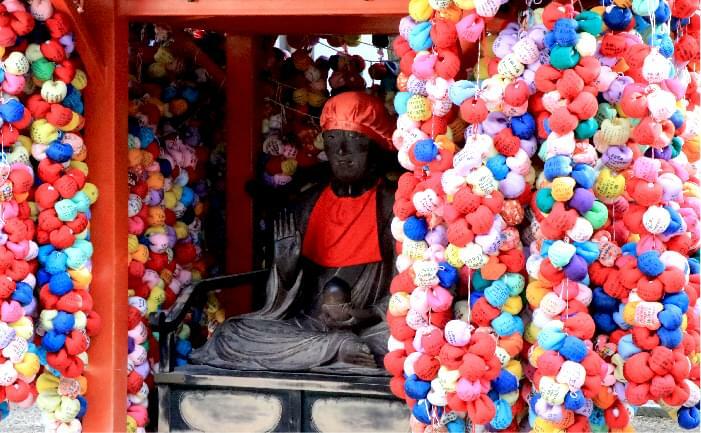 This small temple is the most colorful temple in Kyoto. Its appearance makes it a popular photo spot. 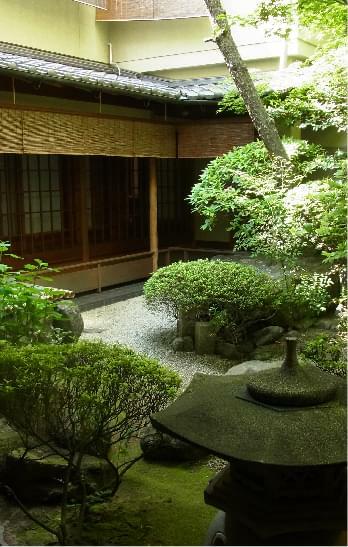 The temple is located a five minute walk away from Sakanoue. The colorful autumn leaves are one of the most popular attractions in Japan. There are many places where the autumn colors can be enjoyed, especially in Kyoto. The maple trees in our garden also turn colors! 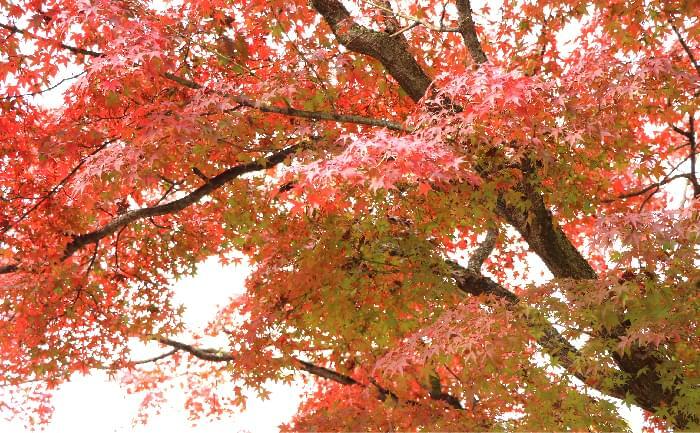 The autumn foliage in Kyoto can be enjoyed during the second half of November. 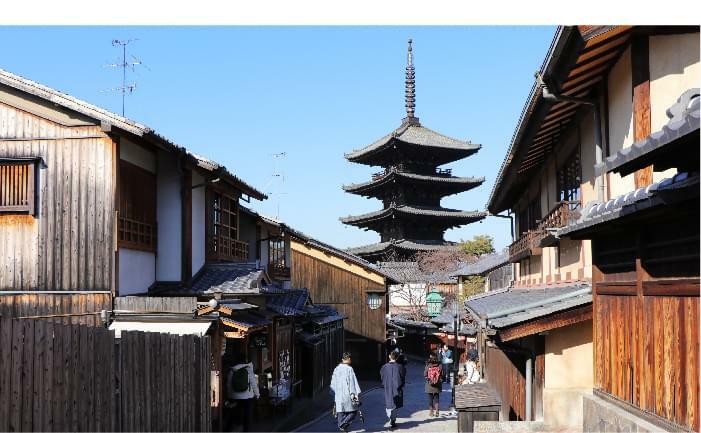 Hokanji Temple, also known as the Yasaka Tower, is one of the most iconic temples of Gion as it can be seen from almost everywhere in the area. The temple is located between Yasaka Shrine and Kiyomizu-dera Temple, and only a ten minute walk away from Sakanoue. 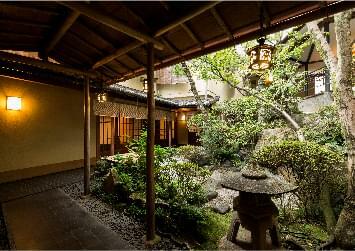 “Sakanoue” is located in Gion, a vibrant yet quiet area where you can experience the historical part of Kyoto. 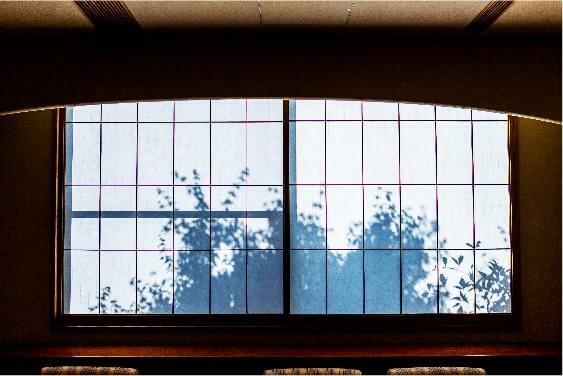 When you look around inside our building, you will discover the exquisite beauty of the Japanese traditional architecture that comes with craftsmanship and passion. 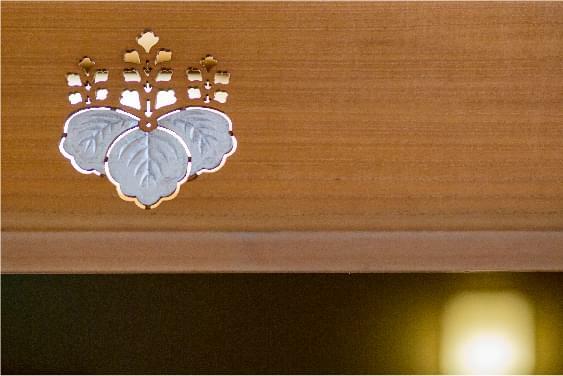 The furnishing we arrange in the rooms, the vases and hanging scrolls, everything is carefully selected for each room to establish a sophisticated Japanese atmosphere. The neighborhood we are located at is very quite. The sounds of cars and people are rarely heard from the rooms, even if the windows are open. 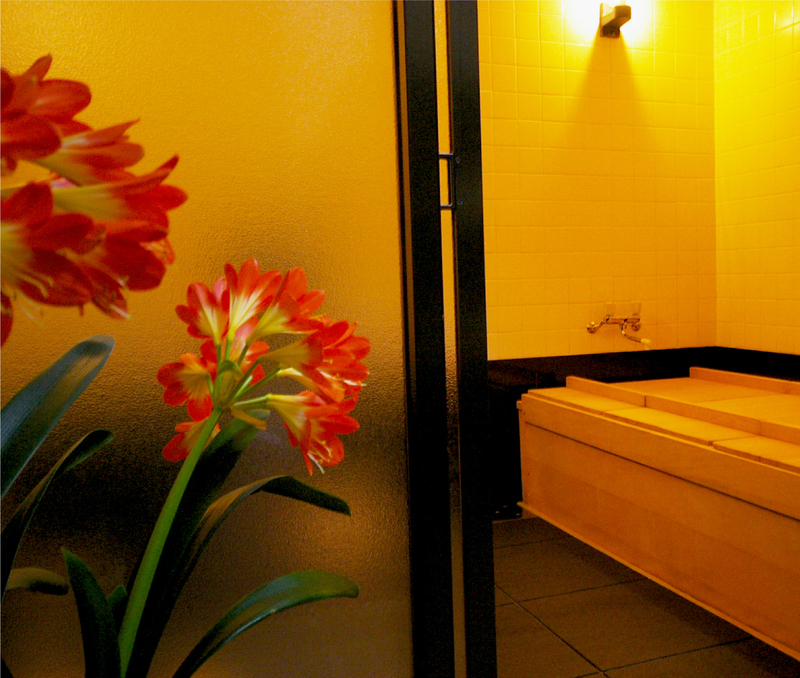 We offer the silence that helps you to relax after a long day. 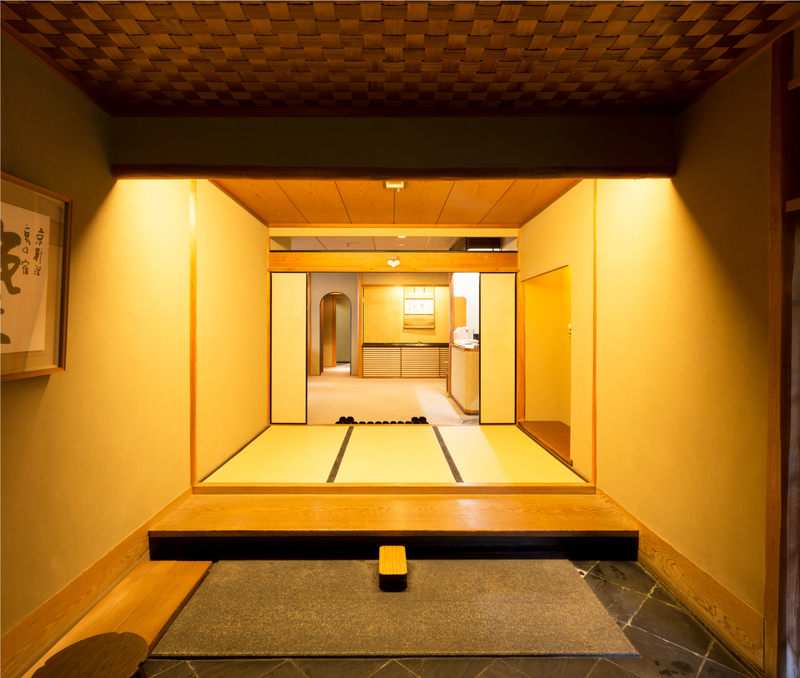 We work hard to offer our guests an unforgettable experience at our Ryokan, which is one of the most distinctive features of the Japanese culture. 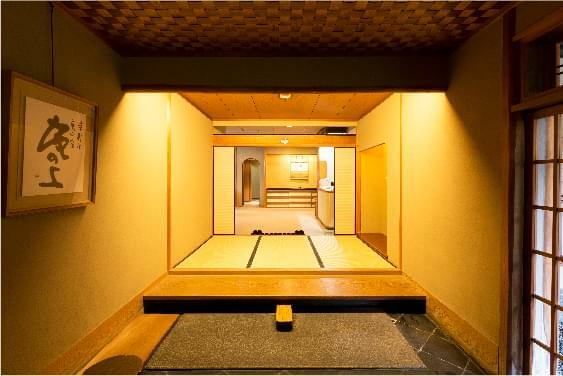 Experience the traditional Japanese culture by staying at a Ryokan. 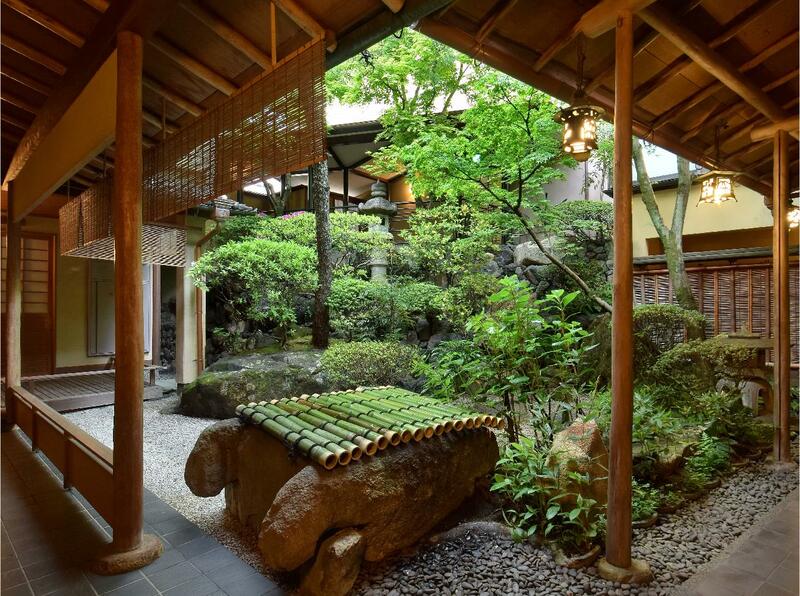 We work hard to maintain the traditional Japanese architecture at our Ryokan. The guest rooms, the gardens, the whole interior and exterior of the building are thoroughly taken care of. 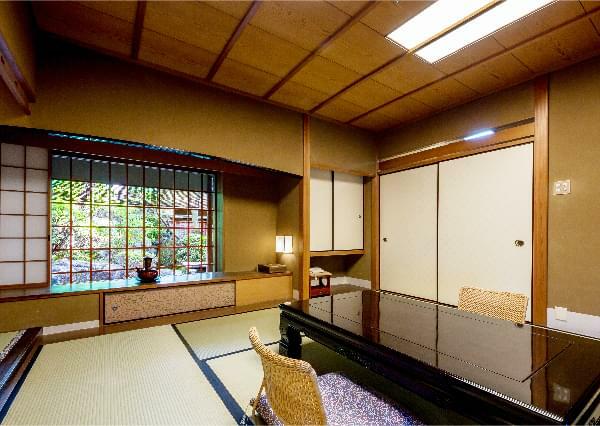 Each room has a unique lay-out and is decorated with hanging scrolls, flowers and other artifact. Staying at our inn will bring you back in time. 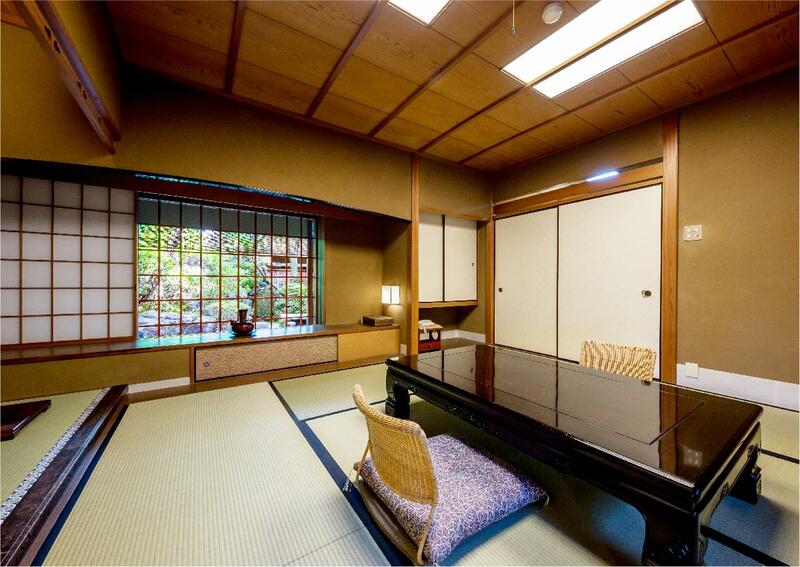 Our building is located only a few steps away from the famous Yasaka Shrine and Kodai-ji Temple. Yet it is isolated from tourists and traffic. The quite atmosphere will give you all the rest you need after a long day traveling. We hope you enjoy a relaxing stay with us. 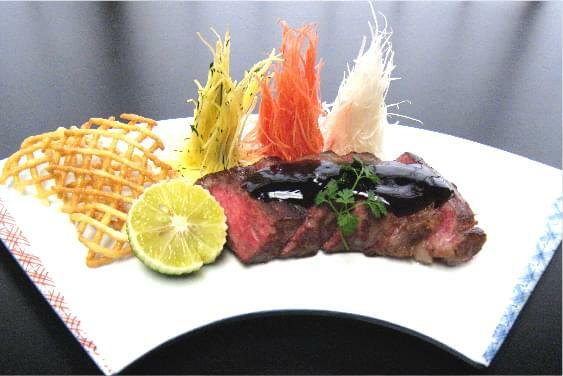 The Japanese atmosphere can also be enjoyed at the lobby. The garden, which can be seen from the window at the lobby, changes through the seasons and creates a special seasonal ambience. You will be welcomed with the scent of incense and a quaint atmosphere. 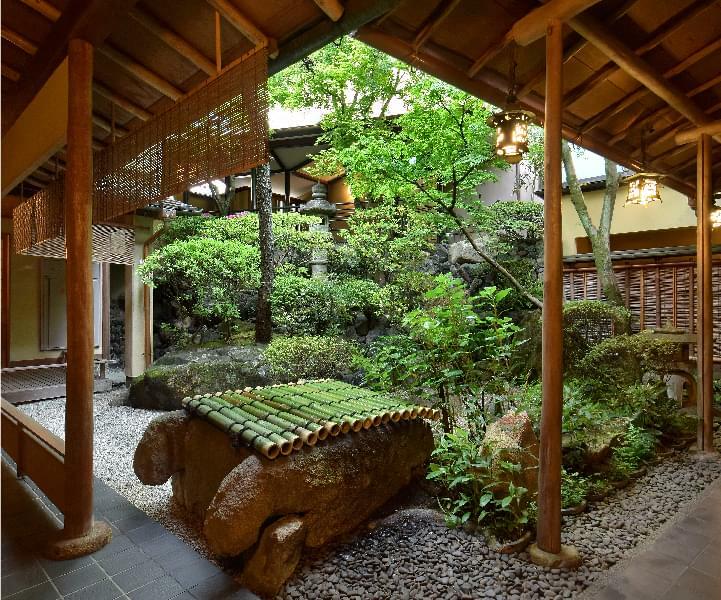 “Sakanoue”, which means “up the hill”, is located at the top of a paved slope path in the middle of the famous Gion area. 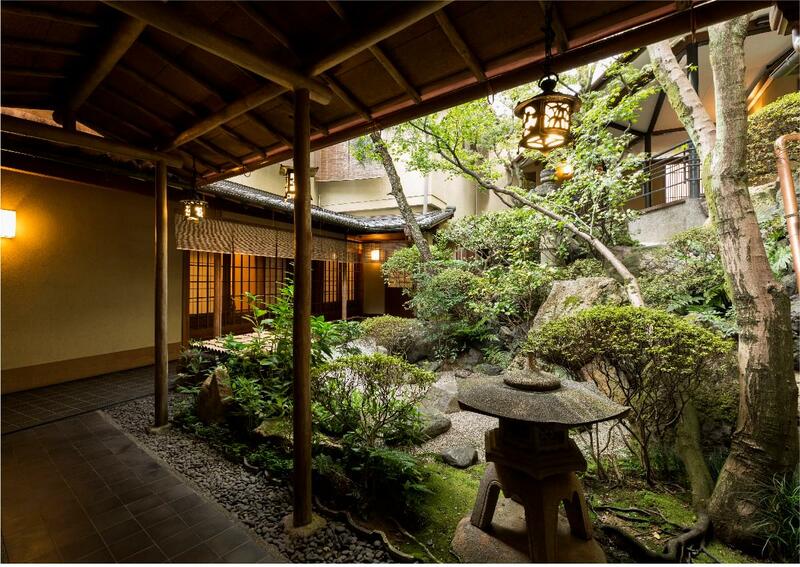 The Yasaka Shrine, Kodai-ji Temple, and Kiyomizu-dera Temple can easily be accessed from our Inn. 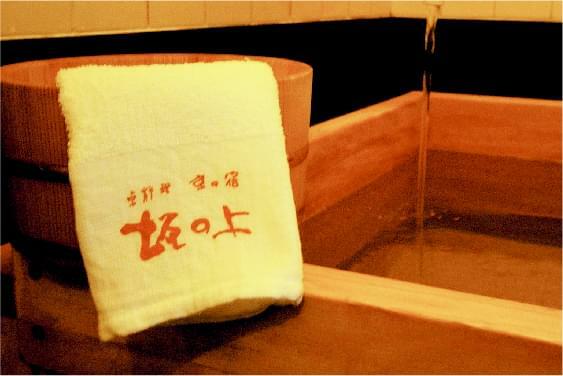 At our Ryokan you can also enjoy the Japanese bathing culture. 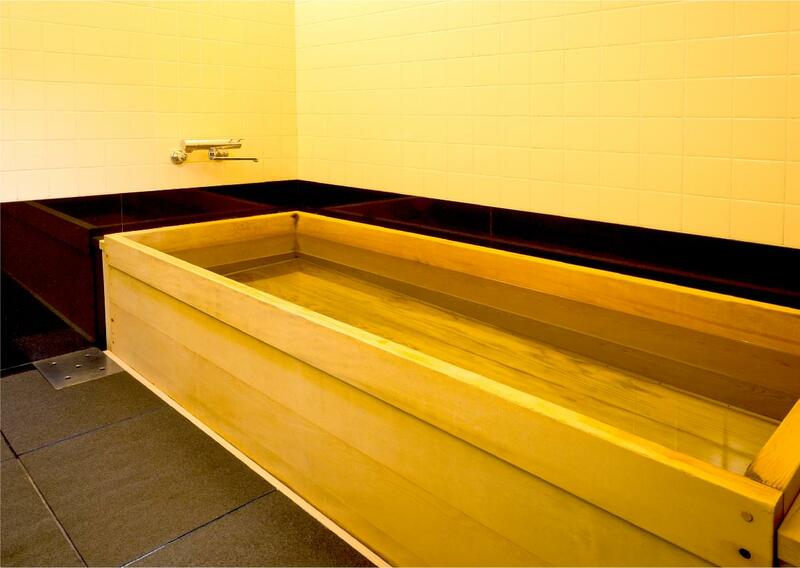 Koyamaki is used as timber wood for the wooden family bath and bathtubs inside the rooms. 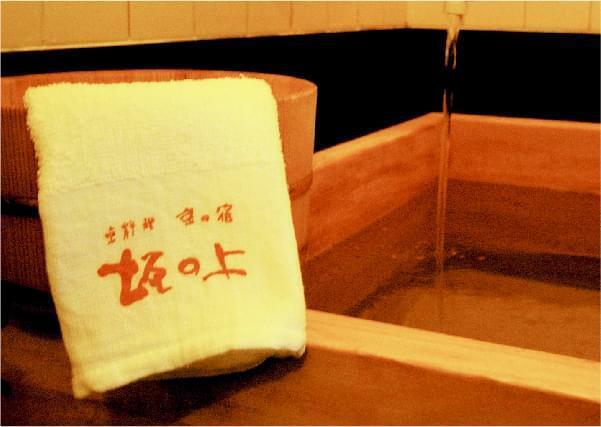 This type of pine tree is famous for its water proof quality and resistance to rot, which makes it the ultimate material for wooden bathtubs. 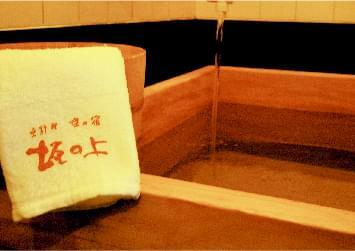 Although the family baths are no natural hot spring, the bathtubs are very cozy and comfortable. 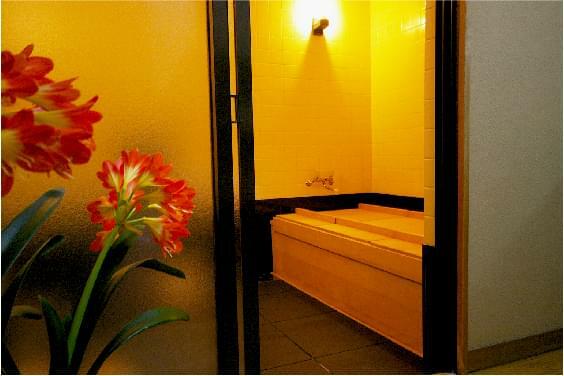 Apart from the baths inside the rooms we also have two family baths. 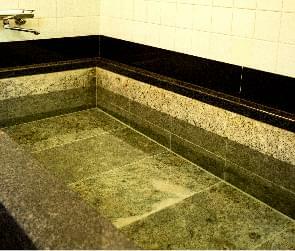 A family bath is a type of private bath which can only be used by guests from the same room or group. 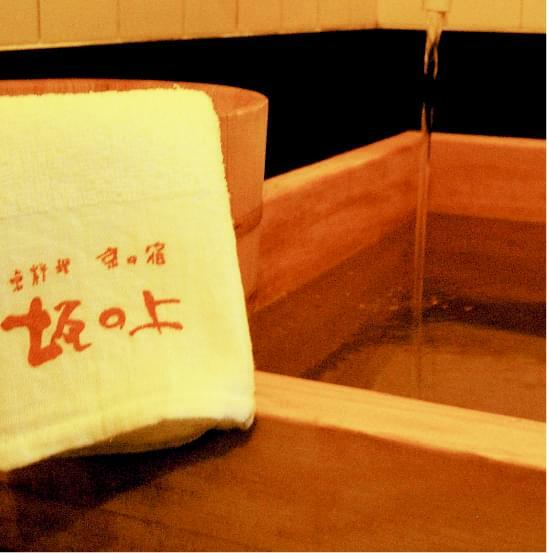 We offer a free usage of these family baths during your stay. 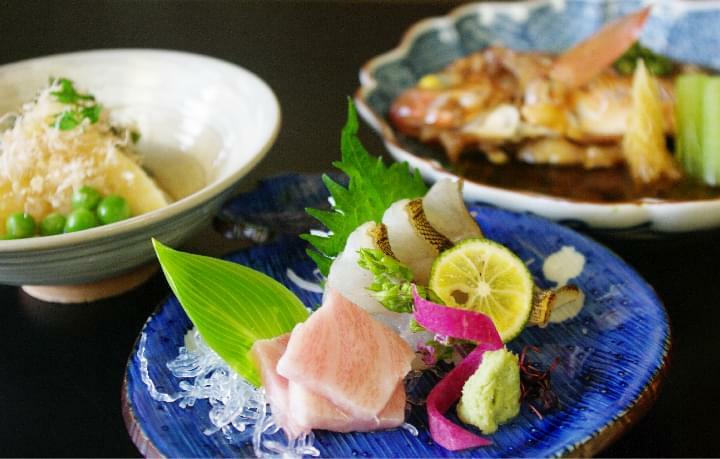 We offer a traditional Kaiseki course with seasonal ingredient served on carefully selected plates. 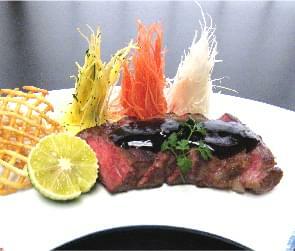 Please experience our well prepared dishes. 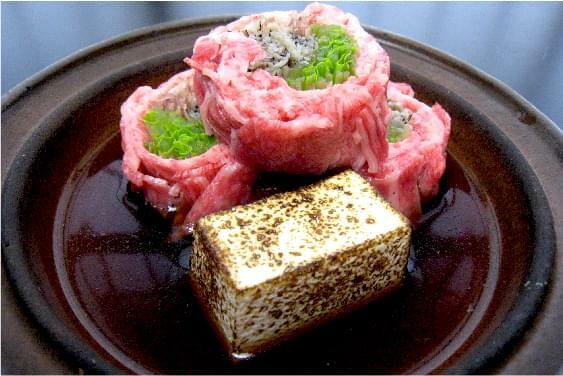 We also offer a special course with Japanese beef for the main dish. 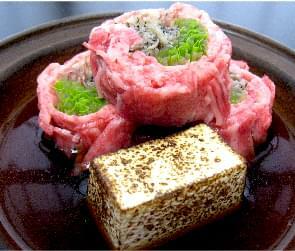 We also offer a special homemade Sukiyaki course, which is a hot pot with thinly sliced beef for the main dish. 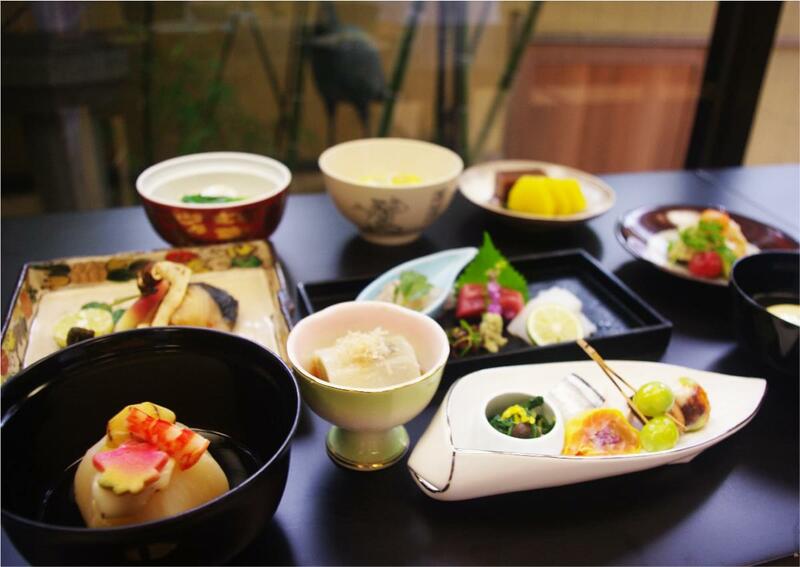 Kyoto is well known for their traditional Japanese sweets. After arrival we serve a cup of tea and a special treat inside the guestrooms. We also provide Western-style confectioneries from the famous pastry shop Jouvencelle. 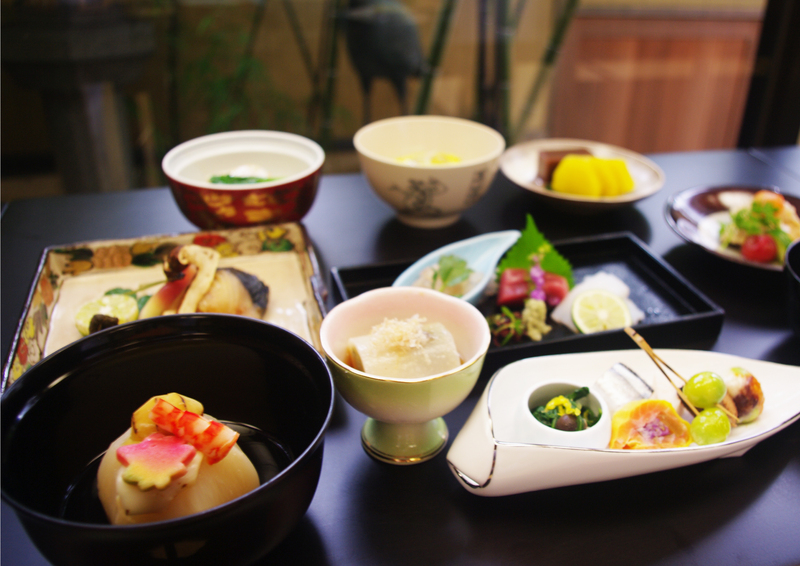 These are served with coffee or tea and require a reservation. Please contact us for further information. Our dishes are finely prepared with the best seasonal ingredients and local specialties. We change the menu every month and adjust it to the time of the year. For those who are staying two or more nights we prepare a completely different menu, so our guests will never get tired of our cuisines. The chef works hard to serve you the best of the best. 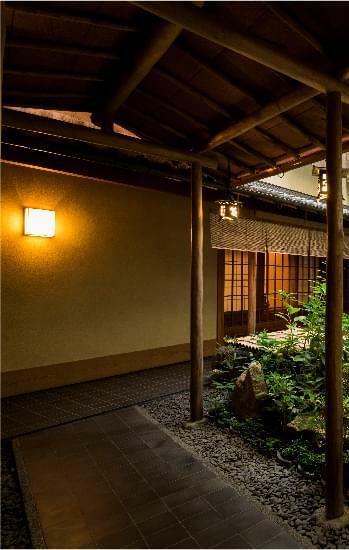 We offer traditional Japanese style guestrooms, each with a unique design and interior. 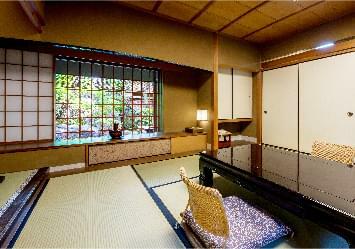 The rooms we offer are authentic Japanese rooms where you can relax in a quite atmosphere. The beauty of the interior can be seen in every detail of the room, such as the openwork carvings, the door handles and the arranged flowers. 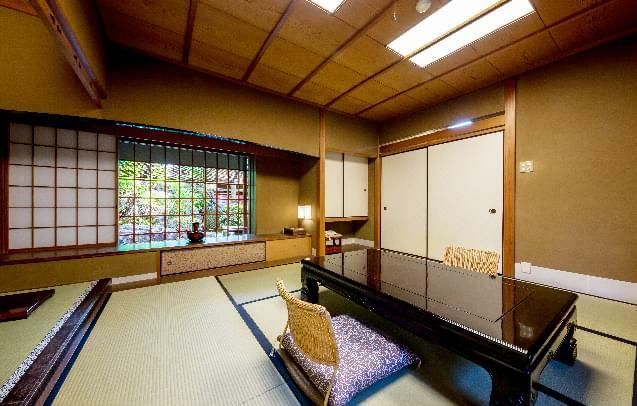 The rooms come with various sizes and are divided in four different types: a six tatami-mat room (about 25㎡), an eight tatami-mat room (about 35㎡), a ten tatami-mat room (about 38㎡), and a twelve tatami-mat room (about 45㎡). Each room has their own bathroom and toilet. 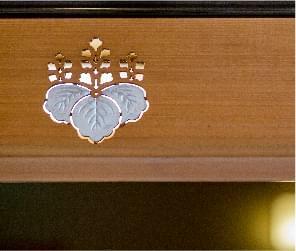 Each room has a wooden openwork carving used as decorative transom above the sliding doors. These carvings all have a different design. 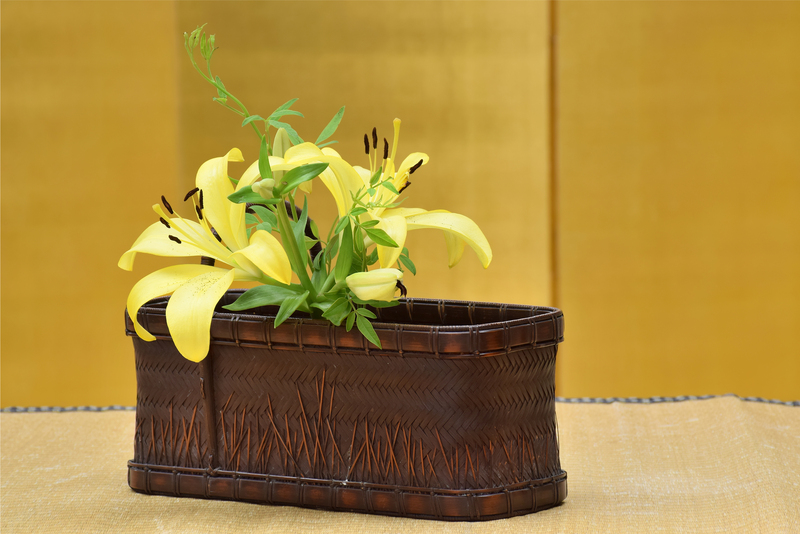 Japanese flower arrangement, or Ikebana, is one of Japan’s cultural traditions. 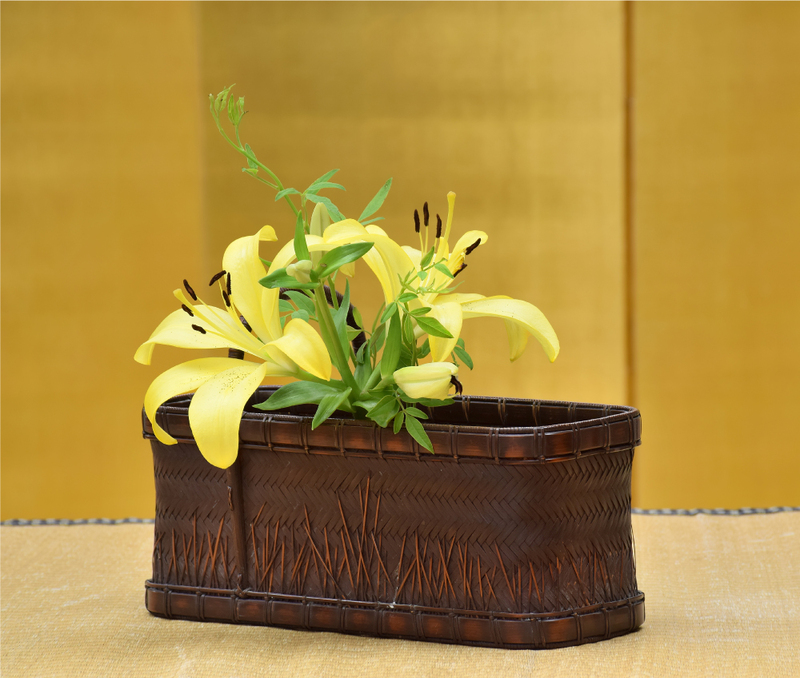 Each room is decorated with these arranged flowers. About once a week we put new seasonal flowers in the rooms, so its interior changes along with the seasons. We hope our guest can take their mind off their daily life and enjoy a relaxing stay with us. 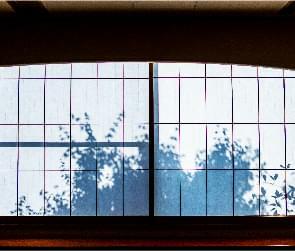 CopyRight(c)　KYOTO-SAKANOUE All rights Reserved.